Watering a JustAddIce orchid couldn’t be easier - all you need is three ice cubes once a week for a full-size phalaenopsis orchid. Watering a tropical plant with ice might seem strange, but independent research has shown watering with ice has no negative effects on orchids. If you choose to use water, be sure to use no more than ¼ cup for a full-size orchid; otherwise you run the risk of overwatering, which can cause root rot. 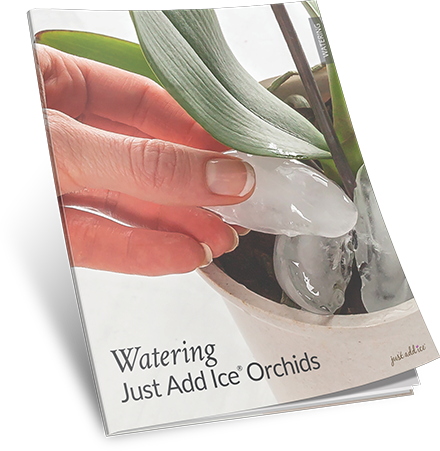 Watering with ice is the easiest and most convenient way to ensure your orchid gets just the right amount of water - not too much or too little. Are You Sure Ice Won’t Harm My Orchid? Research by The Ohio State University and the University of Georgia showed orchids watered with ice had the same flower longevity, display life and root and shoot health as those watered with traditional methods. Where should I put the ice cubes? Place the ice cubes on top of the potting media under the leaves. (Don’t worry, the ice won’t harm the leaves.) If you can’t fit all the ice into the pot at once, wait until some of it has melted before adding more. Don’t put any ice on the crown of the plant. You can certainly use water if you’d like. If you choose water instead of ice, use ¼ cup for a full-sized orchid and 1½ tablespoons for a mini orchid. Make sure to empty any extra water out of the bottom of your decorative pot. What size ice cubes should I use? When it comes to ice cubes, size doesn’t matter. So long as the amount you use measures to about ¼ cup of water when melted, your orchid will receive enough hydration. Misting your orchid with water from a spray bottle doesn’t take the place of watering, but it can be helpful if you notice your orchid needs more humid conditions. If your orchid’s roots are grayish or white, this is a good indicator it needs more humidity. If you decide to mist, make sure your orchid’s leaves have dried by nighttime. How do I know my orchid is getting the right amount of water? The amount of water your orchid needs can change depending on the season and conditions. Check your roots periodically to make sure the orchid is getting the right amount of water. Roots that are getting enough water are green. Roots that are getting too much water are mushy and brown. Roots that need more water are grayish-white. Watering orchids is super simple, but you might still have a few questions. 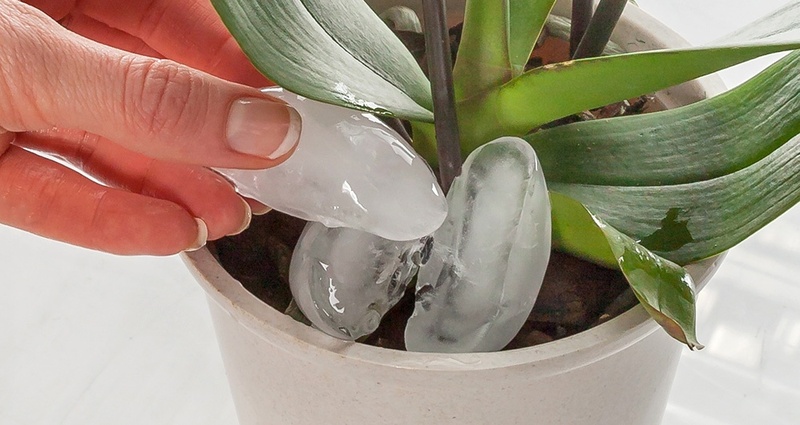 For instance, is it really safe to use ice on a tropical plant? This handy cheat sheet will tell you everything you need to know.